The Empire of Atlantium (a cyber-based non-territorial state) is a unique independent State with a primarily non-territorial immanent global sovereignty based in Sydney, New South Wales, Australia. The Empire of Atlantium was founded on the 3 Decimus, 10500 (27 November, 1981). The Annus Novus year-numbering convention is derived from the approximate date for the worldwide end of the Pleistocene Era and the last Ice Age, and the beginning of the Holocene. Atlantium adopted their flag on 19 Quartarius 10501 (08th May 1982). 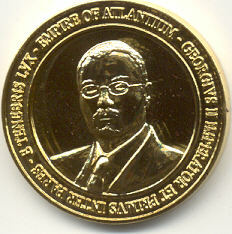 With a nominal value of 10 Solidi (US $10), and featuring a high relief likeness of Emperor George II on the obverse and the Imperial Eagle on the reverse, this unique coin not only marks the 20th Anniversary of the Foundation of the Imperium on 3 Decimus 10500 (27 November 1981), but is also the first ever coinage issue by a global non-territorial state, and will be keenly sought after by collectors in years to come. The diameter of the coin is 38mm with 4 mm Thickness and having weight as 30.5 grams. This coin has been produced by The Aquila Mint, Sydney, Australia. Below is the Mintage of the coin produced in different metals with trial strikes. I purchased my year 10520/2001 10 Solidi copper gold-plated coin from Joel Anderson. It is also possible to purchase this coin directly through Empire of Atlantium's website. In 2011 a bi-metallic 30 Soldi coin was issued to celebrate the 30th anniversary of Atlantium. 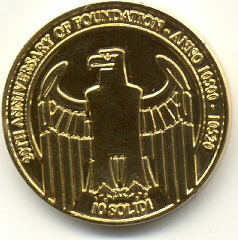 The high relief 38mm cupronickel coin is partially plated in 9 carat gold. The obverse pictures Emperor George II, highlighted in gold, while the reverse shows a stunning Wedge-tailed Eagle (Aquila audax) highlighted in gold. It has a mintage of just 250 pieces.